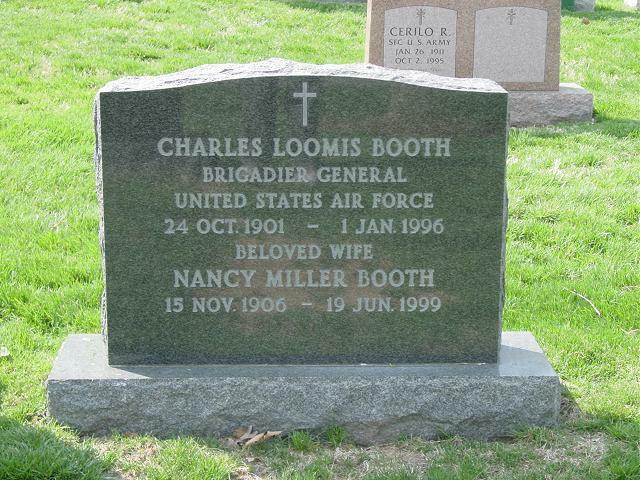 Charles Loomis Booth was born in East Orange, New Jersey, in 1901. He graduated from the U.S. Military Academy, West Point, N.Y., and was commissioned a Second Lieutenant of Field Artillery on June 12, 1924. His first assignment was to Fort Bragg, North Carolina, with the 2nd Field Artillery. In June 1926, he was transferred to Schofield Barracks, Hawaii, for duty with the 13th Field Artillery. Upon his return to the United States in September 1929, he was detailed to the Field Artillery School at Fort Sill, Oklahoma, as a student officer and graduated in June 1930. He then joined the 17th Field Artillery at Fort Leavenworth, Kansas, and served at this station until September 1931. Then he went to Fort Des Moines, Iowa, with the 17th Field Artillery. He became the Post Exchange Officer at Fort Des Moines in February 1932. He then was assigned to the Virginia National Guard as instructor of the 111th Field Artillery in December 1933, serving in this capacity until September 1937 when he went to Indiantown Gap, Pennsylyvania, for duty with the 6th Field Artillery. He accompanied the 6th Field Artillery to Fort Hoyle, Md., and served until January 1940 when he entered the Air Corps Tactical School at Maxwell Field, Alabama. He graduated and returned to Fort Hoyle, Maryland, with the 6th Field Artillery. In October 1940, he went to Fort Benning, Georgia, for duty with the 42nd Field Artillery as a Battalion Communications Officer. He became Commanding Officer of the 42nd Field Artillery during the 1941 Army maneuvers in Louisiana for a short period and then became Executive Officer of the 42nd Field Artillery. In September 1941, he was assigned to headquarters of the Third Air Support Command at Savannah, Georgia. In January 1942, he was designated Assistant Chief of Staff A4, Headquarters, Eighth Air Force, Savannah, Georgia, and the following June he accompanied the Eighth Air Force to Britain, serving in the same capacity. In March 1943, he became Assistant Chief of Staff A4, Twelfth Air Force, in the North African Theater of Operations, and a year later was assigned to Headquarters, Army Air Forces in the European Theater of Operations. In March 1945, he was made Deputy Commander for Materiel and Maintenance, Headquarters, Eighth Air Force, in England. Following his return to the United States, he was temporarily assigned to headquarters Army Air Forces and in January 1946 was ordered to duty at the Army-Navy Staff College, Washington, D.C.
General Booth was awarded the Legion of Merit in 1943. Born in East Orange, New Jersey on June 30, 1901. Commissioned in the Field Artillery from West Point in 1924. Transferred to the Air Corps in 1941. Assistant Chief of Staff of Eighth Air Force January-November 1942. Assistant Chief of Staff of Northwest African Air Forces November 1942-December 1943. Brigadier General in November 1943. Deputy Commanding General of Mediterranean Air Forces May 1944-June 1945. Retired in January 1947. Decorations included two Legions of Merit and the Bronze Star. Died on January 1, 1996.